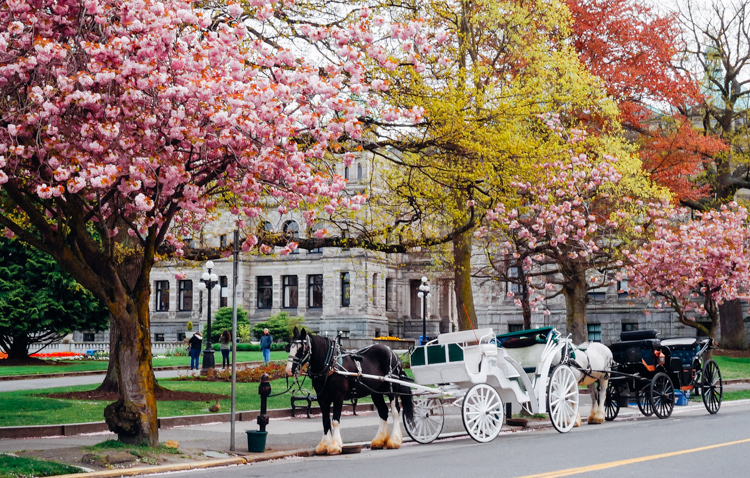 This Capital city of British Columbia Canada is a blend of old world charm and modern experiences, a rare quality that makes it an excellent destination for weekend getaways. And while it’s the historic architecture that attracts most visitors to the downtown area (home to 240 historic heritages sites), I would say overall it’s well-suited for those interested in history, architecture, food and marine life. While the downtown area makes for a nice day trip from Vancouver, I highly recommend staying for at least two days so you aren’t rushed. 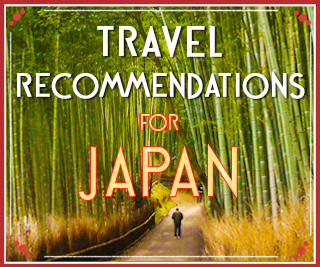 My visit was one of exceptional scenery and food and so I’ve been asked to share some suggestions here! Everything I’ve noted below with the exception of Butchart Gardens is in the downtown area and thus is easily navigated by foot, bus, taxi or water taxi. 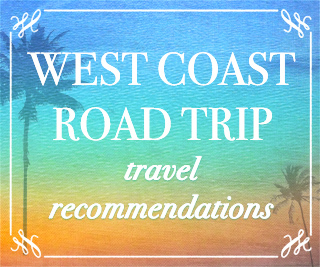 I’d love to explore the rest of Vancouver Island… do you have any recommendations? 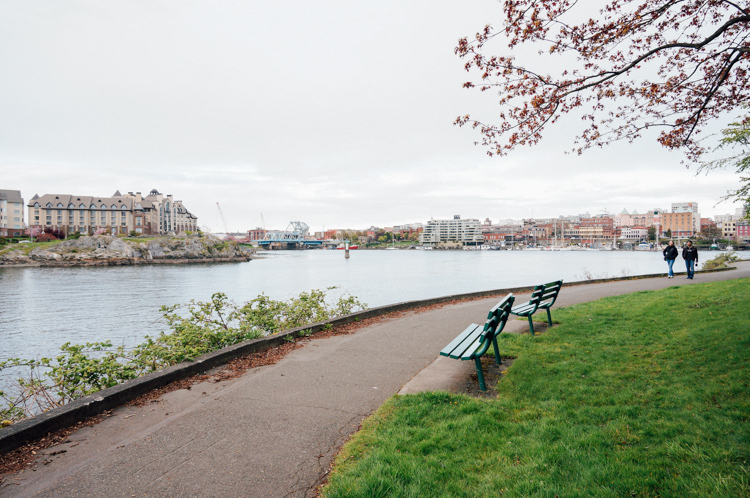 I hope that you get a chance to enjoy a weekend in Victoria, both downtown and beyond. Strathcona Hotel: For an excellent location and budget rate, stay at in at this Victorian historic landmark building which just turned 100 years old. They have a restaurant and seven different bars for some variety. 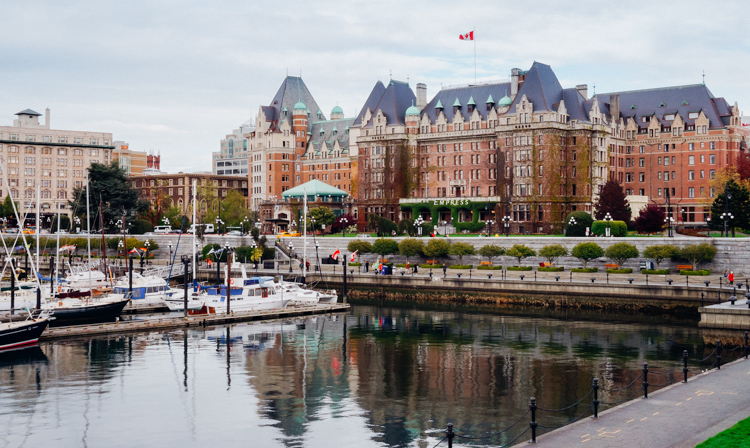 Empress Hotel: For a more luxurious stay, check out this waterfront hotel, dramatic and glamorous. Best Western Plus Carlton Plaza Hotel: This is a nice mid-range option that is clean and comfortable though could use a remodel. It’s a good walkable location, too. This is really all I needed so it’s where I stayed. Willie’s Cafe & Bakery: Breakfast served all day and for me it was one of those meals that I will never forget. Cute outdoor patio, great service, excellent food. They served me a ‘Southern Benny’ with poached eggs on cornbread, grilled bell peppers, homemade chipotle hollandaise and extra crispy home fries. Open since 1887. 10 Acres Restaurant: This relatively new farm-to-table establishment has an all organic menu. It is also the highest rated restaurant in Victoria on Yelp, which is why I chose it. Dear lord, it was fantastic. Bard & Baker Public House: This historic landmark was originally a bank building from 1885, and from today’s decor you wouldn’t know that any time has passed. 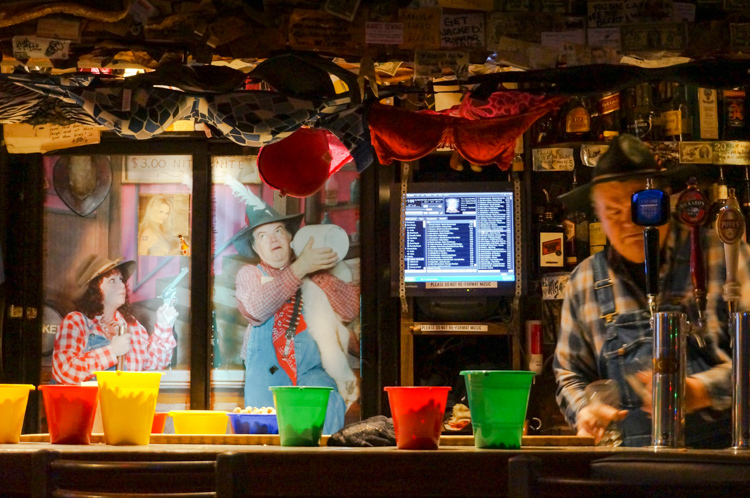 Big Bad John’s: Located on the bottom floor of the Strathcona Hotel this old timey, cowboy-esque dive-bar is lit with strands of christmas lights and the floor is “decorated” with peanut shells. It’s one-a-kind a fun, what else can I say. Visit the local wildlife at Fisherman’s Wharf which you can easily walk to if you’re staying downtown. There you might see harbour seals, great blue herons, bald eagles and sometimes river otters. While you can buy fish to feed the harbour seals, avoid the temptation because these fellas are over-fed and overweight. Be a responsible animal lover Beyond the wharf, river otters and harbour seals are also commonly sighted at the beach access along Dallas Road or by the Oak Bay Marina. Go on a whale watching boat tour with Eagle Wing Tours. 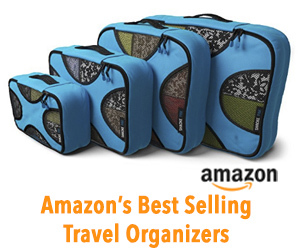 They guarantee that you will see orcas! Take a seaplane tour of Victoria Harbour. A 30-minute flight costs $119 for adults. Seaplanes are one thing they do best in this region, and it’s an fun experience if you’ve never tried it. See Victoria from the water on a short ride with the Victoria Harbor Ferry. This tiny ferry (more like a water bus) has 16 marked stops (see map) is a great way to see Victoria. Harbor Tours cost about $25 or one way harbor taxi rides cost about $5. Watch the water ballet performed by the water ferries every Saturday and Sunday morning from May to September in front of the Empress Hotel. Walk through Chinatown and take in the fragrant wall of teas at the original Silk Road tea store. 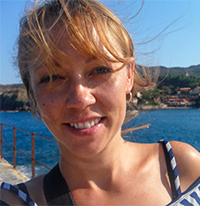 Silk Road has free tea tastings with a shop attached dedicated to aromatherapy, bath and beauty care. 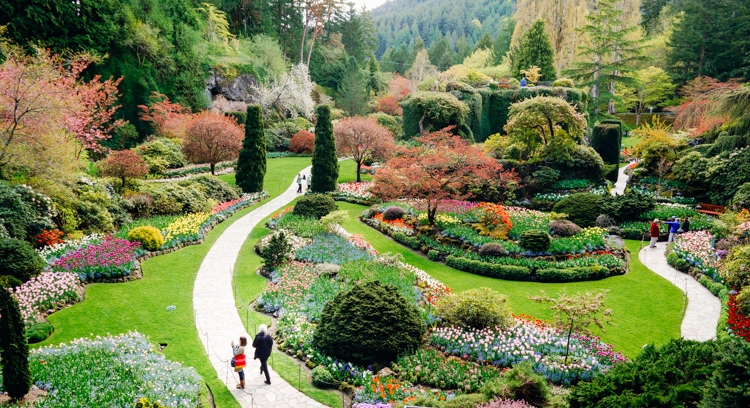 Stroll the sprawling Butchart Gardens. Take the #75 bus which picks up every 3 blocks or so along Douglas Street. Check the schedule at the bus stop because the schedule varies depending on the day. Browse Baggins Shoes, the so-called Kings of Converse who say they have the largest selection of Converse and Vans in the world. This shop has been open since 1969 and is definitely worth a visit. 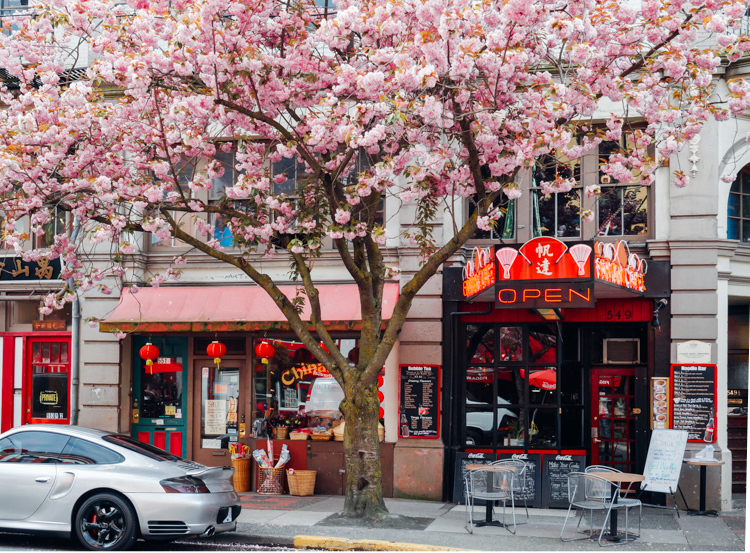 Check out the major hub of comic book stores within three blocks of each other in downtown Victoria.You’ll find current and vintage comic books and memorabilia, model kits, action figures, gaming and more. If you decide to visit Vancouver (which I would do in a heartbeat just to stroll Stanley Park or the sea wall), you can take the new fancy V2V cruise ship and be there in 3.5 hours while dining on board or trying local beer, wine or cider. My Vancouver friends say it’s definitely the nicer way to travel between Vancouver and Victoria. If you’re interested in more suggestions please visit Victoria’s tourism website, tourismvictoria.com. Thank you for visiting TrySomethingFun!